GWTW Forum > Kites! Kites! Kites! > Beginners Corner > New WidowMaker Ordered! P.S. I am also indebted to this forum for helping me choose Skyburner's WidowMaker among a plethora of excellent alternatives. It is going to look great in person! Always happy when someone deviates from the RULE OF ONE! Wow, does that kite stand out in the sky! Thanks for sharing, chilese, I'm feeling even more optimistic! Why isn't the Widow Maker mentioned more when talking about good kites? There may be a cost factor or lack of knowledge. Sometimes I think it's a name thing when newbies come around. Other kites less expensive are talked about a lot. Widow Makers are not talked about as much as others. Except in some rare occasions like this feed. This kite you just bought WILL make you a better pilot. Everyone who fly's it knows it. There is not a trick it can't do. It will help you. Last year she taught me a lot. So far this year I am pushing myself even further. The kite helps. I did my first flick flack the other day. Kite helped. I don't fly well and it takes me time to learn. I am also bias cause Sky Burner is here in town. I wish I could fly all the different kites I have had the opportunity to try. Well over 25-30 kites. But I am only now able to really understand what I am trying to do. I have watched Jon T build kites. Cut and sew and frame. He is truly a craftsman who knows what he built and how to fix it, if needed. He builds each bridle one order at a time. Ties all the knots. I have owned 5 so far. Jon T sold me his Std. last year. I re-sold it and bought a Blue and Gray set. It looks great in blue sky,gray and white clouds. I got a new set a couple weeks ago. Yellow and gray and black and lite gray. I will post photos soon. I am already thinking of another color set. I like change in the air. Jon did a new thing to my bridle on the new set. Really makes a big difference. If you notice my video of low wind. The Widow Maker Ul is my new one. As I do a power 540 and dive to the ground, the bridle hangs lower. He put extensions on the bridle about three long. Heavier so it pulls the bridle out of the way. Some of what i was doing. I know my lines would have tangled. ( because of the million times they have already ). Need to fly about ten more hours to know for sure. Also if you do "Pull Turns" vs. "Push Turns". Your gonna love it. She fly's either way with nice tracking. Again looking forward to hearing your reaction. Be ready to be Happy. *** Fly it at every bridle change so you know the difference. >>> Higher up high winds. Lower for no lower winds. As a twice wounded Vet I have always believed in defending my country,saluting the flag and buying American. Very nice. I like more color. I think its great when these beautiful kites stand out from the sky. ... Why isn't the Widow Maker mentioned more when talking about good kites? History, there were Flame Wars over a statement made by an enthusiastic young man. Like the Sky Sport Design fliers we all had to resort to using coded mentions of the kite or risk being humiliated. 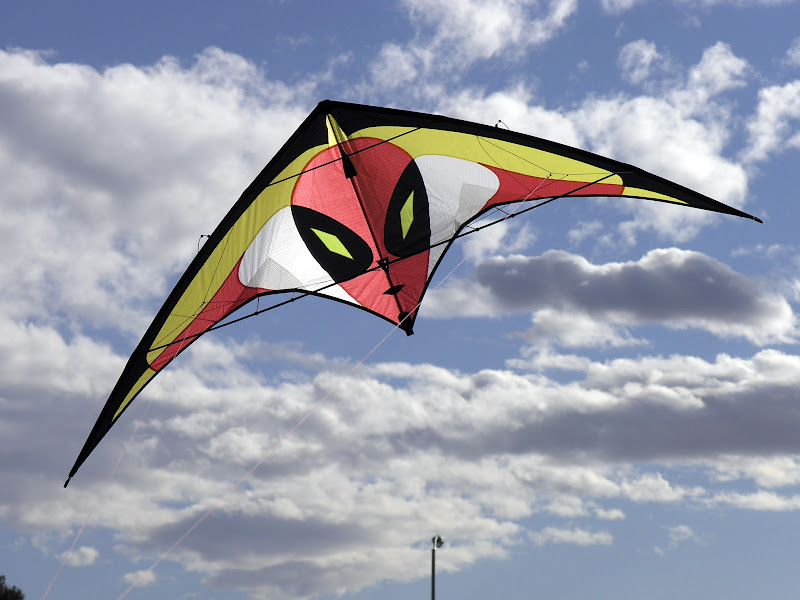 The kite was also called names and the graphics were ridiculed. That blows over after a couple years and we can now mention Lam & John's kites by name again, sadly two generations later. It's that "Forgiving" thing that is built into the kite. The kite gives a bit of latitude on inputs and still tries to give you back the trick it thinks you wanted. If the setup and entrance were wrong it may not be not the prettiest example though. There are two viable arguments for and against that ability. 1: Getting a trick that first time on a forgiving kite starts you on the road to perfecting the trick... or ... 2: A forgiving kite promotes sloppy flying. Either one is true depending on the pilot. Wow !!! Had no idea Mike. I guess my observation wasn't that far off. I like the way you explained the handling of the kite. She does help when in trouble. I am taking photos of my new girls tomorrow. Touchy crowd to please. The new girls are posted. The darker one is the Std. They fly like , they fly like a ... Heck... they fly like a Widow Maker.